News from our Oceanography & Measurement Systems team spotlighting the open seas, ports, and harbors. The Teledyne-RDI 75kHz Long Ranger ADCP (LR-75) is capable of obtaining ocean current profile measurements over a range of more than 500m under optimum acoustic conditions. The deep-water version of the LR-75 was until recently the only commercially available technology for obtaining long-range current profiles in very deep water, and has been widely used in the offshore energy industry. However, in recent years the offshore industry has limited use of the LR-75 for deep (>1500m) ocean measurements based on anecdotal reports of greatly reduced range and degraded accuracy. This was thought to be due to a low density of acoustic scatterers in deep water, which reduces the backscatter signal strength used by the ADCP to estimate the Doppler shift associated with the water motion. 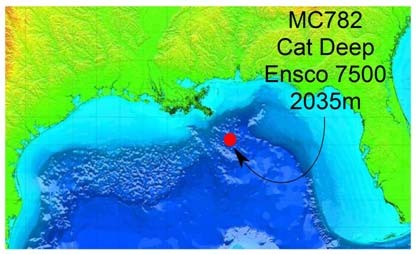 To better understand the performance of the LR-75, WHG developed a proposal to the joint industry group CASE-EJIP for a multi-sensor intercomparison study in deep, low-scattering waters of the Gulf of Mexico. Location of the intercomparison study in the Gulf of Mexico. The study was carried out during June-November 2006 at Chevron’s Cat Deep wellsite (Mississippi Canyon Block 782) in water depth of about 2000m. Two LR-75s and a 300 kHz Workhorse Sentinel ADCP (WHS-300) were deployed by ROV for three 1-month intervals in bottom tripods approximately 65m away from the wellhead of an exploratory drill rig. The ADCPs were oriented so that none of their four main acoustic beams intersected the rig’s vertical riser. Intercomparison current meters whose performance was known from previous studies were deployed on a 500m tall subsurface mooring about 1 km away, including 5 Nortek Deepwater AquaDopps, an Aanderaa RCM-11, and a 1200 kHz T-RDI ADCP. Most of the instruments worked and gave apparently valid data, although significant differences in instrument performance were observed. Analysis showed that currents were nearly homogeneous in the vertical above about 100 meters above bottom (mab), while frequency-dependent bottom intensification was observed in the range of 0-100mab. Despite the low density of acoustic scatterers, the LR-75s gave apparently valid data out to a range of more than 350m above bottom, as evidenced by the ADCP’s quality control parameters (high Correlation Magnitude combined with a realistic gradient of Echo Amplitude). However, the intercomparison showed that the measured velocities from both LR-75s were significantly low-biased in all depth measurement cells (bins), out to the farthest measured range. The speed deficit ranged from nearly 100% in bins close to the ADCP, to more than 10% in bins several hundred meters away. The low bias error is inferred to be due to the ADCP’s reception of spurious scattered or reverberated side lobe signals from the rig’s nearby steel riser. The acoustic beam pattern of the 4-beam LR-75 is such that side lobe energy may be returned from a nearby vertical object, such as a riser, over a time interval corresponding with many range bins. In any range bin, the amplitude of side lobe reflections or reverberations may be significant relative to the weak backscatter signal from scatterers in the water column. The spurious side lobe signals are correlated with the transmitted signal but have zero Doppler shift, so when this correlated “noise” is mixed with the weak backscatter signal from scatterers in the main beams, the ADCP reports a low-biased speed. Such a correlated-noise error cannot be detected by the ADCP itself, nor can the error be corrected in post-processing. Temporary removal of the oil rig’s riser due to an approaching hurricane provided an opportunity to directly confirm the importance of side lobe interference. 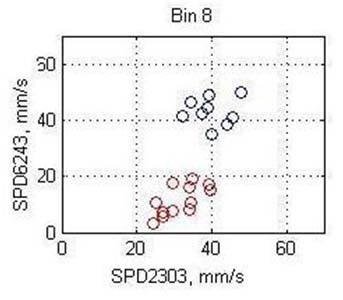 In the absence of the riser, LR-75 velocities in mid-range bin were not low-biased compared to a reference current meter at comparable depth, whereas they were significantly low-biased immediately prior to removal of the riser and after the return of the riser. Comparison of hourly-average current speed measured by LR-75 #6243, Bin 8 (265mab) versus reference current meter AquaDopp #2303 (260mab) with riser present (red) and with riser removed (blue). This study showed that when an LR-75 is deployed in a deep, low scattering environment in close proximity (<500m) to a large vertical non-moving object such as a riser, significant underestimation of current speeds will result due to side lobe interference. There is no possible orientation of an upward-looking four-beam ADCP that will avoid this side lobe interference. If deployment of an LR-75 in the vicinity of a riser cannot be avoided, Teledyne-RDI recommends physically disabling one of the four beams and orienting the disabled beam toward the riser, in order to minimize the strength of side lobe echoes due to the other three beams and permit unbiased current measurements. However, this configuration was not tested in this study, and its effectiveness cannot be predicted from the results of this study.